Smolt traps fishing on the Chignik River. The Chignik River watershed consists of Chignik Lagoon, Chignik and Black Lakes, and several tributaries that provide spawning and rearing habitat for two genetically distinct, but temporally overlapping, runs of adult sockeye salmon. The Alaska Department of Fish and Game (ADF&G) has monitored the sockeye salmon smolt emigration in the Chignik River annually since 1994. 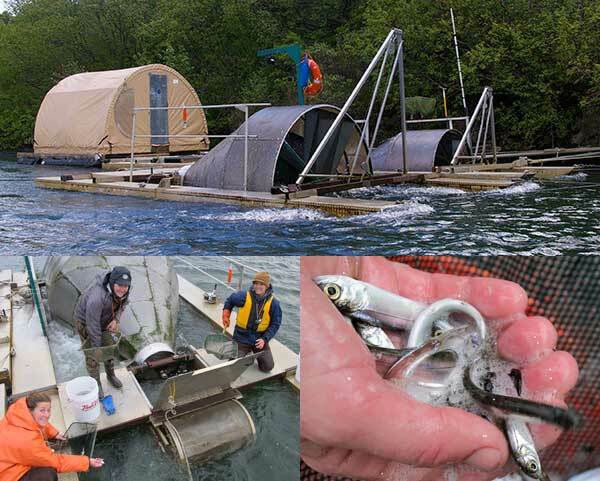 The purpose of these studies is to gauge the health of smolts leaving the system, estimate the marine survival of sockeye salmon smolts, investigate freshwater habitat through limnology and provide a preseason forecast of the Chignik River watershed sockeye salmon run. The Chignik River watershed produces the vast majority of the sockeye salmon for commercial and subsistence harvest in the Chignik Management Area. After emergence from their eggs, juvenile sockeye rear for 1 to 3 years in Black and Chignik lakes, where they feed on aquatic insects and zooplankton before undergoing physical and chemical changes in preparation for emigration to the sea. Juvenile salmon are known to migrate to sea after certain size thresholds are met, during specific seasons, and under certain environmental conditions such as temperature changes. Recent work in the watershed indicates that after emergence and initial feeding, Black Lake juveniles move into Chignik Lake for overwintering. Competition for space and food between populations of juvenile sockeye salmon in Chignik Lake may cause seasonal migrations of either subpopulation into areas of lower smolt density, early emigration to sea, or possibly early migration into Chignik Lagoon. Information derived from smolt and watershed monitoring is crucial for understanding changes in the production capacity of the salmon habitat of both Black and Chignik lakes and how these changes affect each population. Aerial view of smolt traps actively fishing on the Chignik River. To estimate the number of sockeye smolt emigrating from the Chignik Watershed, two rotary-screw traps are operated during the outmigration period. From approximately late April through early July, the traps fish continuously with the captured fish being channeled into a live box at the trap terminus. Throughout the day ADF&G field personnel check the live box and all species are identified, counted, and either retained for sampling or released unharmed. Species other than sockeye salmon include: juvenile coho, chinook, dolly varden, stickleback, and coastrange sculpin. Clockwise from top: Weatherport sampling station and smolt traps in the Chignik River, sockeye smolt, field personnel checking the live box. Scales (for age determination), length, weight, and a genetic tissue sample are collected from 200 smolt per week. This biological data provides information on the outmigration timing, growth characteristics, and condition by age class of smolts. It is also used to estimate the marine survival of Chignik sockeye salmon and forecast adult returns relative to the total number of emigrating smolt. Each week, ADF&G biologists conduct mark-recapture experiments to determine trap efficiency. A small percentage of captured smolt are temporarily marked using Bismarck Brown dye and then released back into the river upstream of the traps. The number of recaptured smolt is used to calculate the efficiency of the traps and in turn to estimate total number of sockeye smolt that outmigrate from the Chignik River. Since 1994, estimates of sockeye salmon smolt emigrations from the Chignik watershed have ranged from 2.9 million to 28.1 million. Bismark Brown Y dye for marking; comparison of unmarked and marked smolt. Releasing marked smolt for mark-recapture test. In addition to the basic biological data collected, genetic information helps fisheries biologists identify outmigrating subpopulations of sockeye salmon juveniles and understand how competition between Black Lake and Chignik Lake juvenile sockeye salmon impacts survival. Genetic samples are collected from smolt and fry collected at the smolt trap and from beach seine samples in Chignik lagoon. Genetic studies also elucidate potential differences in emigration timing between stocks and provide further detail for stock-specific return predictions. Collecting fish for genetic samples. Limnological studies evaluate the physical characteristics of lakes, including temperature, dissolved oxygen, light penetration, pH, and alkalinity. These studies also evaluate the availability of nutrients that are need for algal growth, which are the bottom of the food chain. Zooplankton, which are a major forage food for juvenile sockeye salmon, are driven by these physical characteristics and algal production. Changes to any one of these factors can affect rearing and migratory behavior, and therefore survival of a juvenile sockeye salmon. 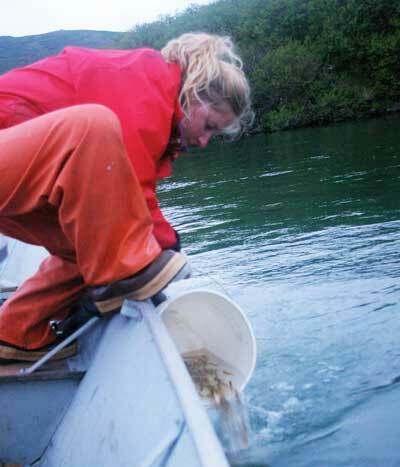 Limnology sampling occurs monthly from May to August in both Black and Chignik lakes. 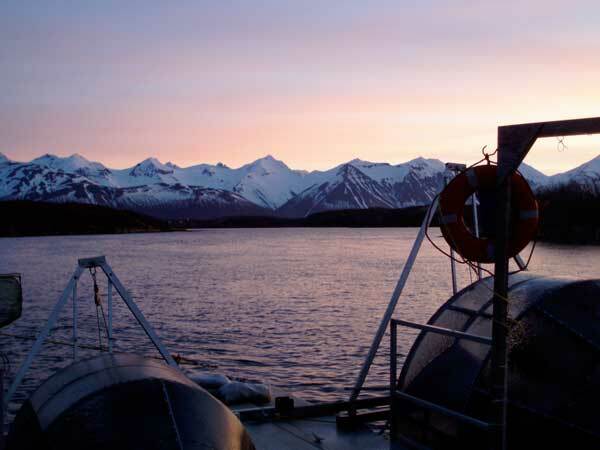 Water samples are initially processed at the Chignik field laboratory and then sent to the Kodiak Near Island Laboratory for further processing. 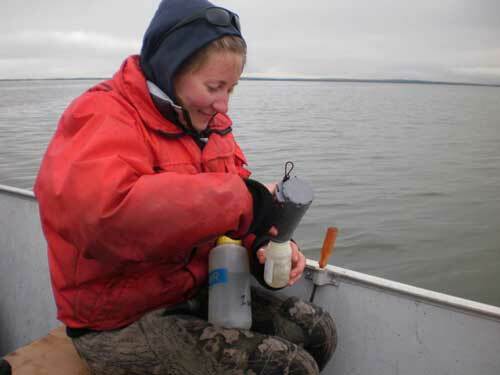 Field personnel collects water samples at Chignik Lake. Zooplankton (left to right): bosmina, daphnia, and diaptomus. Each spring ADF&G personnel also participate in educational outreach projects at the schools in the Chignik area. At each village, kids participate in educational presentations and hands-on activities about Pacific salmon, watershed health, subsistence uses, and the role ADF&G has in managing and monitoring the valuable salmon resources of the Chignik area. Educational outreach at the Chignik area schools. Interested in the Chignik adult monitoring and weir counts? Click here for up-to-date information (PDF 70 kB). For web site content and information please contact: Mary Beth Loewen at marybeth.loewen@alaska.gov.